The Google Adwords certification is given to individuals who have demonstrated their proficiency Google’s pay-per-click (PPC) advertising system, recognizing them as experts in online advertising. 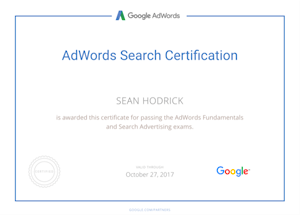 In addition to the Adwords Fundamentals exam, Sean also received his certification in Adwords Search Advertising which focuses on the creation, management, measurement, and optimization of advertising campaigns. Google Adwords is a flexible tool that displays results quickly and acts as a valuable platform to test keywords and adjust audience targeting. The optimized results can then be applied to SEO and content development. Adwords also increases conversion rates substantially compared to organic search, delivers measurable ROI, and can be applied to all types of businesses. 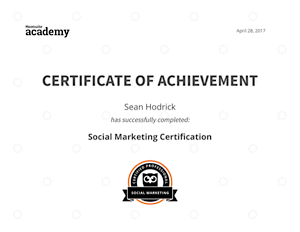 Hootsuite’s Social Marketing Certification demonstrates the recipient’s proficiency in social media marketing tactics and implementation. The certification coursework and exam include sections on optimizing social media profiles, social media strategy, growing online community, and content marketing.